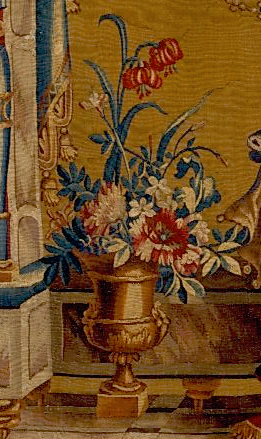 Although the famous series –of which this tapestry is a part — has been known as Grotesques de Berain, the flowers were actually the work of the flower painter Jean-Baptiste Monnoyer (1636-1699). It is certainly possible that Berain’s work inspired the series of cartoon or that he may have provided preliminary sketches. The designs were certainly completed in by 1689 as, in that year, several pieces from the series were used as security for a loan by Beagle, the director of Beauvais. It is also known that Monnoyer left for England in 1690. The present tapestry is signed by the director of Beauvais, Philippe Behagle. Born in Audenarde in 1641, he was trained at Gobelins and subsequently worked at several factories outside Paris. In 1677, he was appointed manager of the workshops at Tournai and within six years he was to be asked by Colbert to reorganise Beauvais and to succeed Louis Hinart. Beagle became director of Beauvais in 1684. 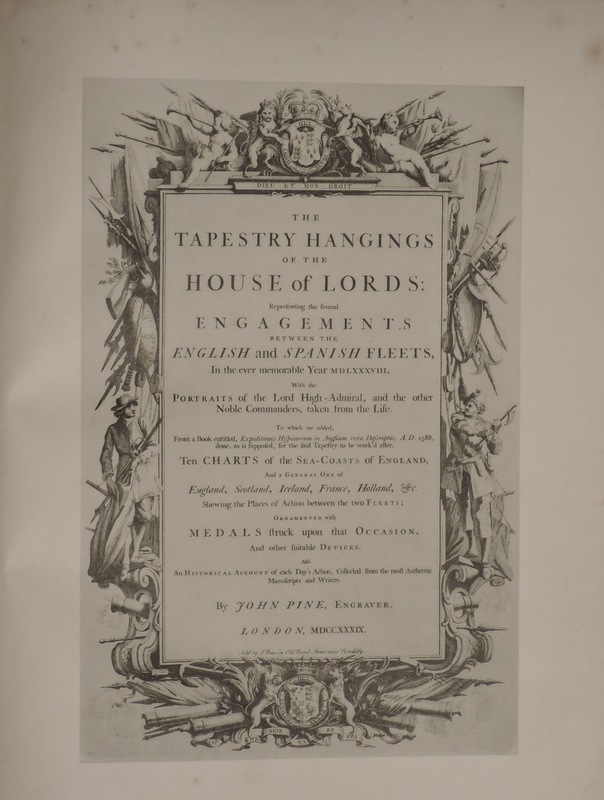 He immediately commissioned important new designs and opened a showroom i Paris for the sale of tapestries. It is from this period that the famous series began to be produced and sold. Of the twenty or so new series, the Grotesques were the most successful and important and were still being ordered long after Beagle’s death in 1705. The design is comprises an architectural screen standing against a tobacco a tobacco background and above which are suspended ribbons, flowers and quivers of arrows. Draped over the screen is a huge curtained edged with tassels. 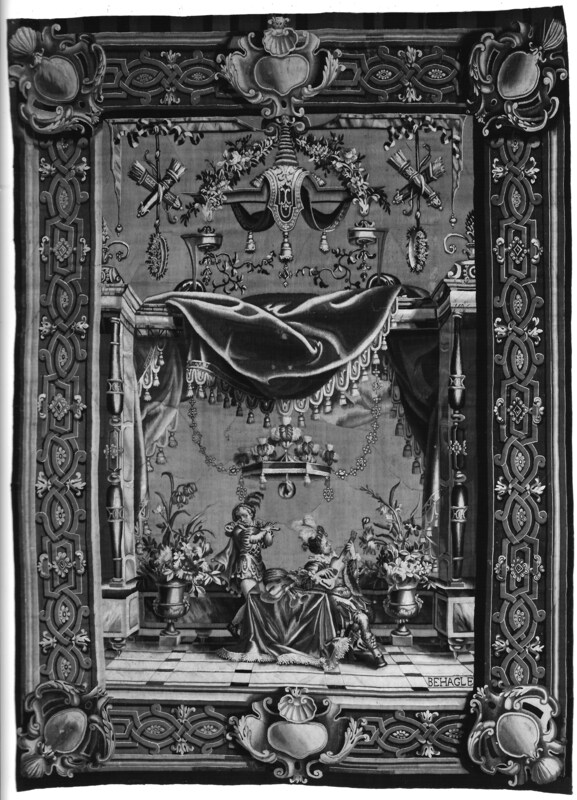 Standing below is a figure playing the flute; beneath a small canopy at his side is a table covered with musical instruments at which sits a second figure playing a small guitar or mandolin. They are flanked by large urns brimming with flowers. The border, designed by Berain, has red bastions rompus on a blue ground with large shield shaped cartouches with shells in the centre and in each corner. The significance of the series of designs should not be underestimated. One write has commented that, in contrast with the style of Le Brun and the Gobelins, they announced the art of the eighteenth century. 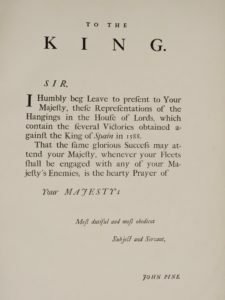 It is certain that they enjoyed great success and over one hundred and fifty examples have been recorded with adaptations and copies being produced at Aubusson and Berlin. The set of which this tapestry is part has now been dispersed. 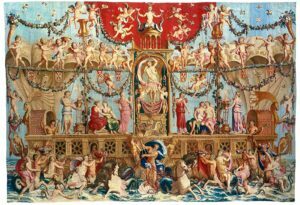 One panel was given by Mrs John Mackay to the Victoria and Albert Museum, London, in 1909 and is published in the Catalogue of Tapestries, AF Kendrick, no 46, 1924. A further tapestry from this set is in the Museo Lazaro Galliano, Madrid. 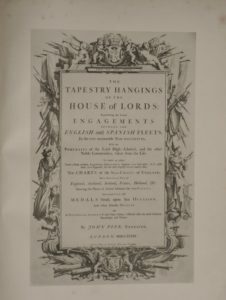 The remaining six tapestries, which are The Musicians, The Feast of Pan, The Dancing Piper, The Elephant, The Slack Rope and The Feast of Bacchus, were published in a privately printed catalogue by Leland Hunter. Hunter also chose to publish the present tapestry in his book The Practical Book of Tapestries. 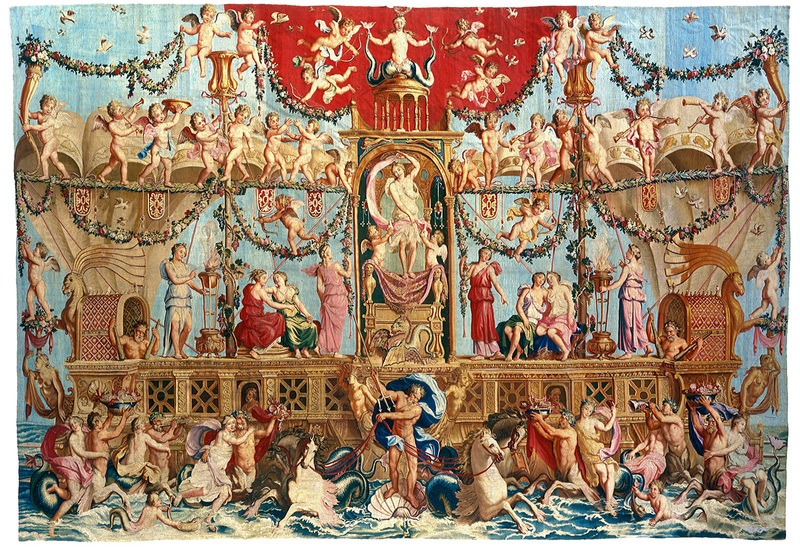 Only two of the set are signed and it is known that four of the tapestries were sold at auction in 1939. A number of other versions of The Musicians are known. One with the bastions rompus border signed Beagle which must be from another set, is at Kronberg Castle, Denmark. Further examples with more usual borders are known: one example with Chinoiserie border, in the Schloss Bruchsal, Baden is published in French Tapestry by Weight (pl LV). A further panel in the Archbishop’s Palace, Aix is published in Wandteppiche by Göbel (pl 209). It should be made clear that the patron of this tapestry is by no means certain. 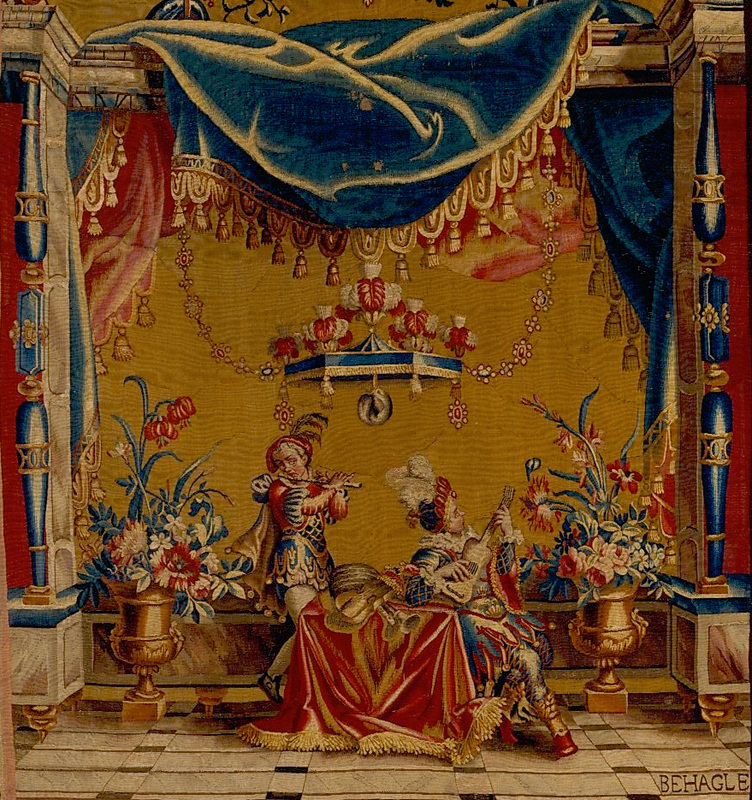 However, a collection of correspondence between Daniel Cronström in Paris and Nicodemus Tessin in Stockholm between 1693 and 1718 (published 1964), which deals in considerable detail with specifications for a set of Beauvais tapestries ordered for Carl Piper, the Swedish Chancellor, could well refer to the Mackay set of which the present tapestry formed a part. Before ordering the set, Cronström wrote in 1695: Je vous conseille absolument de ne pas laisser passer la Grotesques de Beauvais. C’est assurément une chose singulière pour son prix et digne d’un homme de votre goût. His advice was evidently accepted and a room plan subsequently sent to Paris. It was decided that 16 aunes or 64 feet of tapestry was needed and furthermore that the panels would need to be two thirds of the height of the usual cartoons. Cronstrôm, in a letter, describes that he had selected a border different from the usual floral border recommended: Je fais mettre à la grotesques, une bordeure d’un goust grotesque du dessein de Berain., à bastions rompus rouges sur un fond bleu. 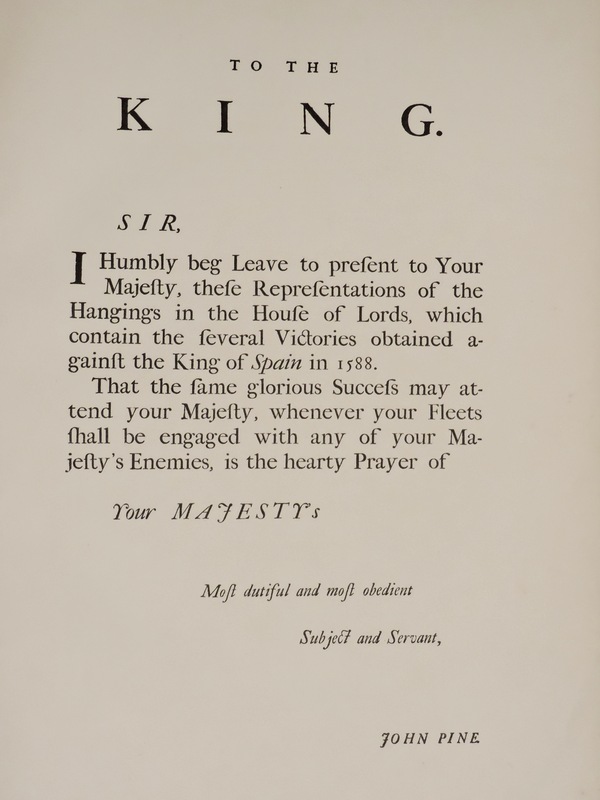 The fact that the Mackay set is the only known set of Beauvais Grotesques with the Berain border under nine feet in height makes it possible, if not likely, that this was the set woven for Piper. The ownership of the set prior to this century has bot been possible to establish. The present panel was sold from the Mackay Collection to Countess Bessenyer from whose collection it was acquired. Badin La Manufacture de tapisseries de Beauvais depuis ses origines jusqu’à nos jours. Avertissement par Jules Guiffrey. (Paris, Société de Propagation du Livre d’art 1909). This entry was posted in Featured Tapestry and tagged Tapestry on September 27, 2016 by fransestapestryarchive.